Instem’s KnowledgeScan Target Safety Assessment (TSA) service is setting new standards in biological target profiling. Harnessing leading edge augmented intelligence capabilities, our pioneering, technology-enabled service is transforming the TSA process, driving quality, pace and insight in Research & Development. 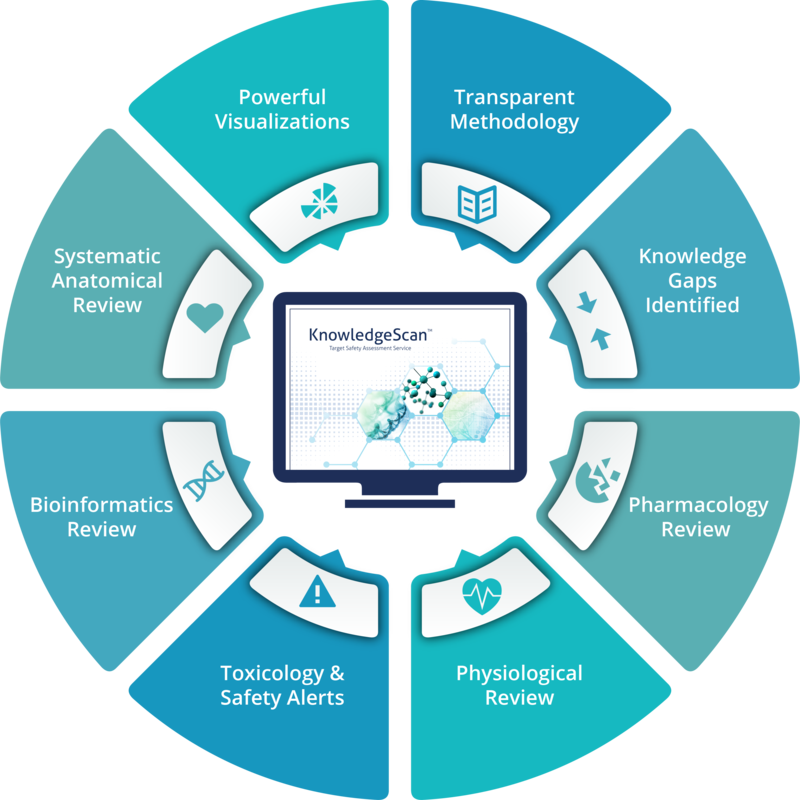 Built on a winning combination of fast, powerful computer-aided data acquisition and manipulation, automated workflows, and human expertise, KnowledgeScan gives clients detailed insight into the potential toxicological risks and challenges associated with modulating their drug targets, enabling them to make faster, better informed decisions. Using our proprietary KnowledgeScan Translational Informatics platform, we quickly and systematically review and distill millions of data records from a variety of published sources. These data are carefully curated, reviewed and interpreted by our team of expert life scientists and presented to our clients in a comprehensive, consistent report format. Comprehensive - KnowledgeScan systematically processes millions of records from numerous sources to ensure no key data are missed. Resource Efficient - By using automated data mining techniques, we can review and distill a huge wealth of data sources much faster than humans alone, enabling clients to spend 100% of their time making meaningful decisions. Unbiased - By deploying automated processes, KnowledgeScan removes the bias associated with manual literature searches, delivering a systematic, independent review of the published literature. Consistent - KnowledgeScan is based on reproducible, automated workflows, ensuring a standard approach across all TSAs. These standardized practices deliver accurate, high quality reports every time. High Quality - All data identified during the TSA process are reviewed and interrogated by our scientific experts to ensure data quality, accuracy and integrity. Flexible - By outsourcing your TSAs to Instem, you have a flexible, dependable resource that can be called on weekly, monthly or annually as needed to suit your TSA demands. To find out how KnowledgeScan can help improve Target Safety Assessment processes at your organization, why not take advantage of our free, no obligation 30 minute KnowledgeCall consultation? Contact tsa@instem.com to book your consultation with one of our experienced KnowledgeScan team. Full TSA: Using our KnowledgeScan platform and automated workflows, data are collected, processed and curated. This high quality, refined information is then toxicologically reviewed and interpreted by our experts and provided to our clients, giving them a comprehensive, unbiased analysis of the risks associated with modulating their target. Full TSA clients also benefit from our Evergreen continuous updates service. As scientific research continues to evolve, Instem identifies, reviews and evaluates new findings, providing clients with ongoing, regular updates on their drug target. Core Data TSA: For clients who have their own in-house Toxicologists, we can provide a Core Data TSA on request. Our Core Data service uses the same KnowledgeScan tools and workflow to capture and collate the data, and then the information is presented to the client for them to undertake their own data interpretation and risk assessment. By selecting the Core Data TSA option, clients can make informed, evidence-based decisions in accelerated time frames, safe in the knowledge that no data has been overlooked. Clients no longer have to spend hours searching and analyzing the data, leaving them free to focus on data interpretation. To help you evaluate our solutions, we believe that an initial, no-pressure presentation carried out over the Internet is the way to go.